Who me? Oh go on! No really, go on and sign that contract! After an extremely successful stretch as the Knicks interim head coach at the end of the 2011-12 season, the Knicks have decided to give Mike Woodson an extension. With an 18-6 record to close out the regular season and the Knicks first playoff game victory in over a decade, Mike Woodson more than proved that he deserved to be coaching the Orange and Blue next year. It is a multi-year extension for an undisclosed amount. Woodson was extremely excited to get the interim tag removed from his title. Woodson made it clear that he wanted the job from the second that former head coach, Mike D’Antoni, said he could no longer coach the Knicks. Upper management did not let Woodson’s effort go unnoticed. This is the first of many pieces of the puzzle that the Knicks must finish before next season starts. I think Mike Woodson is a good fit and I look forward to seeing how he handles a full season in the toughest city to coach in the world. This entry was posted on May 25, 2012 by MatthewToddErich. 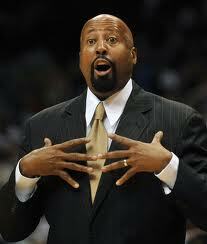 It was filed under Basketball, NY Knicks and was tagged with Mike Woodson.